In this age of tuition inflation, every dollar helps when it comes to paying for college. While student loans have become increasingly common in the U.S. (70% of 2015 graduates had student loan debt, an all-time high) work income remains a key source of funding for many college students. In fact, according to a 2015 report from researchers at Georgetown, over 60% of college students maintain a job during school. Read the 2017 edition of our study of the best cities for working students. Paying for school with work income instead of loans has numerous benefits beyond the purely financial. Students who are employed during school will graduate with more experience and therefore potentially better job opportunities than their non-employed peers (all else being equal). If they work in a job that is related to their degree, they may form professional relationships to help them in their careers as well (think job recommendations, mentors, etc.). Find out now: How long will it take to pay off my student loans? 2.3%. The unemployment rate for workers with some college education in Rapid City, South Dakota, the top city for working students. $13.00. 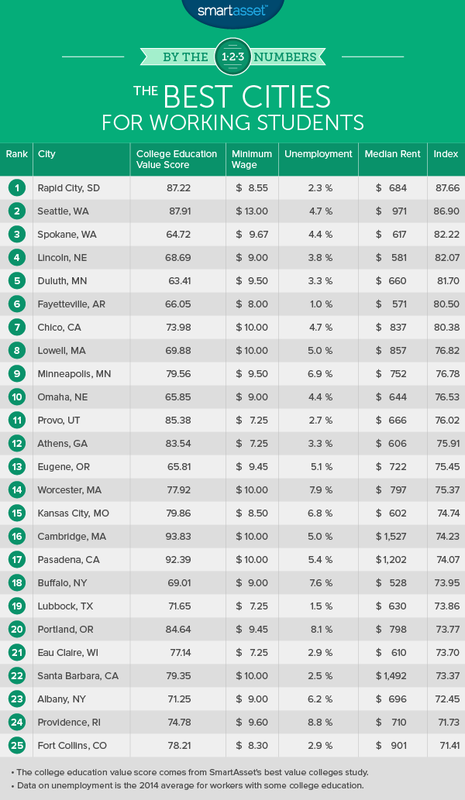 The minimum wage (for large employers) in the number two city for working students, Seattle. The statewide minimum wage, which applies in third-ranked Spokane, is $9.67. Five. The number of Midwestern cities to rank among the ten best for working students. Nebraska and Minnesota each had two cities in the top ten, in addition to South Dakota’s top ranked town. The South Dakota School of Mines and Technology rated as the number one best value college in South Dakota in SmartAsset’s 2015 study, and number 22 in the United States. For working students at SDSMT, the deal gets even better. As mentioned above, workers with some college education face an unemployment rate of just 2.3% in Rapid City, one of the lowest rates in the country. That means more and better job opportunities for working students. Seattle’s economy has been growing rapidly in recent years, which can lead to plenty of job openings for college students. The city’s diverse assortment of employers in technology, healthcare, financial services and education means internship and other work opportunities for students in nearly every major. Try SmartAsset’s super smart cost of living calculator. For college students working in a relatively low-wage industry such as foodservice, Seattle is also a good place to be. The city has one of the highest minimum wages in the country at $13.00 per hour (for large employers). For tipped employees, the minimum is $10.50, more than four times the federal tipped-employee minimum of $2.13. Spokane is home to a number of colleges and universities, including Whitworth University and the University of Gonzaga, both of which rank among the top 10 in the state for their high value. It addition to the high state minimum wage and relatively low living expenses in Spokane, working students at these schools will benefit from living in income tax-free Washington State. In addition to being the state capital of Nebraska, Lincoln is the home of the University of Nebraska’s flagship campus. UNL students who want to hold a job during school benefit from the city’s low unemployment rate – just 3.8% among workers with some college education – as well as its size. With a population of more than 260,000, Lincoln has job opportunities for college students in a number of fields. Located amid the pristine beauty of northern Minnesota, Duluth ranks as the fifth best U.S. city for working students. Beginning in August of this year, workers in the city benefit from a Minnesota state minimum wage of $9.50 for large employers (it is currently $9.00). The small-employer wage is $7.75. The population in Fayetteville is now more than 80,000, up from about 58,000 fifteen years ago. A large reason for that rapid growth is the region’s strong economy. Overall unemployment in Fayetteville is less than 4%. For workers with at least some college education, it is even better: just 1%, according to the U.S. Census Bureau. As of January 1, 2016, California has the highest state minimum wage in the country, at $10 per hour. That is good news for working students in Chico, many of whom work in low-wage industries like retail or office services. Students at Cal State Chico also benefit from the school’s low cost of attendance. Annual tuition is just $7,026 for in-state undergraduate students. That, and a cost of living in Chico that is generally lower than the rest of the state, make the school fairly affordable to attend. Located northwest of Boston, Lowell is one of several Massachusetts cities to rank among the top 25 best for working students. UMass Lowell is fairly affordable, with annual instate tuition of about $13,000. For a college student earning the Massachusetts minimum wage of $10.00 an hour, that annual tuition could be paid in full with 25 hours of work per week (before taxes). While the classic setting for a college campus is a small, relatively rural town, attending school in a big city has major advantages for working students. It means a much larger pool of potential employers in a wider variety of fields. In Minneapolis, for example, working students could land internships at the Target Corporate headquarters, U.S. Bancorp or Xcel Energy – all Fortune 500 companies. The second Nebraska city to rank among the ten best for working students, Omaha is home to a number of colleges and universities. The largest is The University of Nebraska Omaha, followed by Creighton University. Working students at each of these schools benefit from the city’s low unemployment rate – less than 3% as of summer 2015. 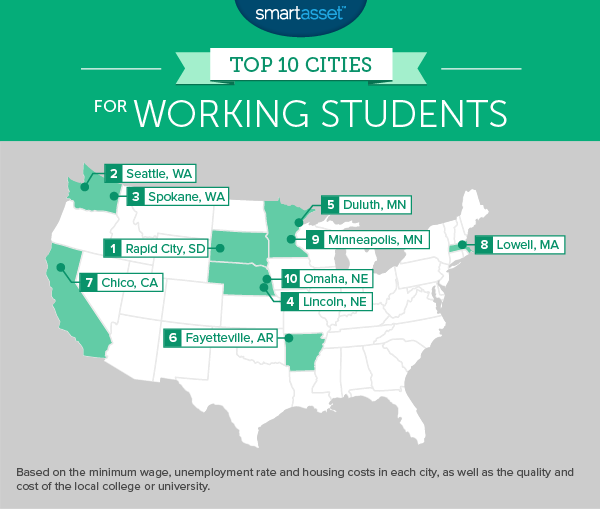 To find the best cities for working students, SmartAsset looked at data on 227 major U.S. cities that are home to a four-year college or university. First, we looked at data on the city itself, considering the minimum wage, unemployment rate (for workers with some college education) and median monthly rent in each. For those three metrics, we calculated how many standard deviations above or below the mean each city rated. We totaled those scores and indexed them to 100 – the city that was the highest above the mean in the three categories scored a perfect 100. That score represents the strength and accessibility of the job market in each city. Rent and unemployment data used in SmartAsset’s study comes from the U.S. Census Bureau. Minimum wages data is based on the applicable city, state or federal minimum wage. For jurisdictions that differentiate between large and small employers, we used the large employer rate. Likewise, for areas with minimum wage increases schedule for 2016, we used the updated rate.